Click Here to Sage Sre Kagabujandar Guru Temple Photos. The famous 'Thondai kingdom' (which lies to the north of Tamil Nadu), which had been ruled by the Thondaimans had many scholars to its credit. To the south west of Kanchi (Kanchi is considered the Holiest of the seven holy places of pilgrimage for attaining salvation) lies a holy place called 'Sumangali' where Sre Bhaaskharamaharishi was born on an auspicious day. It is apt to say that Sre Bhaaskharamaharishi was born as a holy son of the holy place Sumangali. Sre Bhaaskharamaharishi was born in the Tamil year called Keelaga on an auspicious day in the Tamil month of Thai on the third day of pongal (farmer's day- equivalent to the Thanks Giving Day in U.S. and Canada ) when people happily worship the Sun God who is responsible for the good harvest. According to the English calendar, he was born on Thursday. According to the Indian standard time, he was born at 10:30 a.m. under the influence of the star Moolam that falls under the Moon sign of Sagittarius (Dhanusu raasi) in the pisces ascendant (Meenam Lagna). According to the Astrological sources the moment of his birth predicted all good fortunes (Raja yoga). According to the English calendar he was born on sixteenth day of January 1969, at 10:30 a.m. According to geographical location he was born in a place situated at 79�-50'' eastern longitude and 12�-50''-north latitude. Thus, Sre Bhaaskharamaharishi was born as an incarnation of the Siththas (a class of celestials possessing eight mystic powers) on the earth. Sre Bhaaskharamaharishi was born to a couple named Ramakrishna gavundar and Kuppammal respectively. 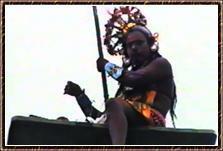 The Maharishi hails from the warrior race of 'Sage Sambuga' namely Vanniyar race. He was born to the parents as the first blossom, and also as an incarnation. The vanniya race is the gothra of 'Sage Sambuga'. The original name of the Maharishi was Bhaaskharan. According to the Hindu tradition the first-born child's birth should take place in the maternal grandmother's place. So, in accordance with the Hindu tradition Sre Bhaaskharamaharishi was born in his maternal grand mother's native place namely 'Sothiyambakkam'. Since the Maharishi was born on an auspicious day namely 'pongal' day when people take delight in worshipping the Sun God (who is responsible for a good harvest), the beat of the drums which is considered as a sacred sound could be heard and it appeared that nature blessed the new born child as if to say, "Long live o child", Long live o child"! His parents, with loving care and tender affection, brought up Sre Bhaaskharamaharishi. The family, which was depended on agriculture for its livelihood, began to prosper day after day. His father Ramakrishna gavundar got employed as a teacher in a Government school shortly after his birth. According to the moral instructions of his paternal grandfather, he was sent to a primary school at 'Sumangali' at the age of 3, to get his kindergarten education. 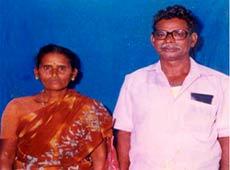 At the age of 5, he was sent to the Government Middle School at Sumangali where he was admitted in the First Standard. He studied up to the Fifth Standard in the same school. He possessed a profound knowledge of different subjects from a very early age. Undoubtedly he was the best student at school and the teachers praised him for his intelligence and knowledge. Due to adverse circumstances prevailing in the family, the family moved to Brahmmadesam, a small village in the year 1978. He joined the Fifth Standard in the Brahmmadesam Primary School and pursued his studies of the Sixth Standard and a part of his academic course in the Seventh Standard in the Government High School at Brahmmadesam. As a result of the tender and moral instructions given by his pious grandfather, he started growing up as a holy child with great devotion to God. Due to some unfavorable conditions, the family moved to the Maharishi's maternal grandmother's place at 'Sothiyambakkam' in 1980. Due to the great care, affection and attention the Maharishi received at his maternal grandmother's native village, he grew up in a peaceful and happy environment. 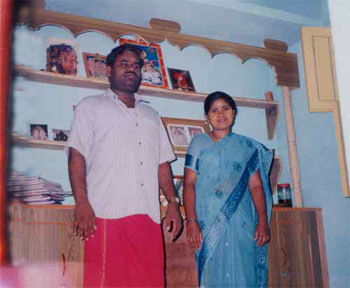 He did his Seventh Standard at the Mamandur (Dusi-Mamandur) Government Higher Secondary School. His intellect grew by leaps and bounds day-by-day. He passed the Talent Test conducted for the best students of the Eighth Standard at the District level (Cheyyar Educational District) with outstanding marks. Due to his excellent performance in Talent Tests, he received a special scholarship through out his carrier at school up to the Tenth Standard. When he was in the Ninth Standard, he was selected as the School Pupil Leader and retained the same position for two years. He started the Literary Association and won the applause of his teachers and his fellow students for his marvelous speeches. Everyone held him in high esteem for his remarkable ability in speaking. He adopted a different method of approach in answering the questions given in the examination. Based on the points given about a particular topic in the text, he wrote down his own opinions on the subject while answering the examination papers. He was in the habit of cross-questioning his teachers so much so that whenever the teachers happened to see him, they were held in a grip of fear. Sre Bhaaskharamaharishi stood first throughout his academic course at school. 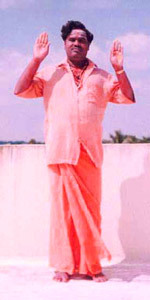 On successful completion of his education at school in March 1984 with outstanding marks, Maharishi took up a course in technology, and got admitted on fifteenth day of August 1984 in a college named "Adhiparashakthi Polytechnic" attached to the famous peedam of the Aadhiparaashakthi, Melmaruvaththur. The Aadhiparashakthi Siththar Peedham provided a sumptuous feast for satisfying the Maharishi's Divine hunger, during his stay in the hostel for doing his studies. During his stay in the hostel, Maharishi was in the habit of going to the temple every morning and evening worship the Deity namely-"Aadhiparaashakthi" and get the blessings of His Holiness "Bangaaru Adigalaar". Thus, Maharishi spent his best days when he was doing his studies there. During his dreams and in his conscious state of mind he received the Divine Blessings of Mother Aadhiparaashakthi and received the seeds of spirituality, which would enable him to grow into a great man, who would achieve great things in the spiritual world. In April 1987, he got a First class in the Diploma in Civil Engineering. Often Maharishi used to think over and rejoice about his act of placing his Diploma Certificate at the Holy feet of 'Bangaaru Adigalaar', fall on his knees in order to receive the Diploma from the hands of His Holiness. During the period from 1987-1990, he had been to many temples to enrich his spiritual knowledge. At times he undertook many jobs, which required engineering skill, and earned his livelihood. He enriched his spiritual knowledge by reading books written by Siththas and books on Literature. 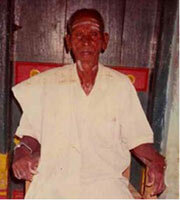 The Supreme Preceptor of the Universe - "Sre Kagabujandar" appeared to him many times in his dreams. So the 'Maharishi' identified him as his spiritual Preceptor (Guru) and mastered his Holy texts. Being the eldest son of the family, it was his prime duty to educate his 3 younger brothers and uplift them to fulfill his duties to his family. So, he got employed as a Site Engineer in a reputed concern at Chennai to discharge his duties to the family. By virtue of his hard work in the field of Engineering, he was considered as the Best Engineer who was capable of laying the best roads and was appreciated by the public for his special skill and devotion to his work. During his carrier as an Engineer, he came into contact with many Government Engineers and was taken by surprise and filled with grief when he came to know of the injustice going on in the world. With such a state of affairs on one side, the Divine Crop grew day by day and the abundant growth of spirituality could be felt in him. Finally, Maharishi who adhered to justice resigned his post as an Engineer in 1992. The Maharishi who realized the importance and merits of married life got married to a distant uncle's daughter named 'Revethi'. With the Blessings of God and his Guru (Preceptor) Sre Bhaaskharamaharishi got married to Revethi on Monday, the twenty second day of the Tamil month of 'Aaani' in the year 'Aangirasa'. He got married to her at a moment, which predicts all good fortune i.e. the moment when the Star Uththiram, Moon sign of Virgo (kanni raasi) and the Pisces ascendant (Meena lagna) come together. According to the English calendar, they got married on sixth July 1992. The marriage was held with great pomp and show at 'Kanchipuram'. Sre Bhaaskharamaharishi's wife Revethi, incarnated as the fourth daughter in the birth place of the Maharishi namely Sothiyambakkam to the couple 'Ganesa gavundar 'and 'Panjalaiammal' as an incarnation of God. Revethi was born on an auspicious day in the year called 'Brahmmadeesa' on Saturday, the thirtieth day in the Tamil month of 'Aavani'. According to the Indian standard time she was born at 7:50 a.m. under the influence of the Star 'Revathi' in the Moon sign of Pisces (Meenam raasi). Her ascendant is Virgo (kanni lagna). The moment of her birth predicts all good fortunes. According to the English calendar, she was born on fifteenth September 1973, at 7:50 a.m. in the morning. The Sre Bhaaskharamaharishi-Revethi couple was blessed with 3 daughters as fruits of their happy married life. The first child was named 'Dhanalakhshmi', the second was named 'Gurulakhshmi', and the third was named 'Yoghalakhshmi'. 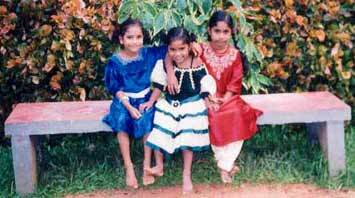 They are growing up as virtuous, loving and pious children. Sre Bhaaskharamaharishi had the good fortune of going to 'Kollimalai' (a hill from south of Tamilnadu) which is under the Over Lordship of 'Sre Gorakkar', the disciple of 'Sre Kagabujandar' . Had it not been for the Blessings endowed on Sre Bhaaskharamaharishi by 'The Supreme Preceptor of the Universe - "Sre Kagabujandar"and his disciple Sre Gorakkar, he would not have got the unique opportunity to go to Kollimalai At Kollimalai Sre Bhaaskharamaharishi worshipped 'Arappalleeswarar' and his consort 'Arampaadiamman'. Having worshipped the God and the Goddess, he went to take rest in a place opposite to the temple. When the Maharishi fell asleep, he had a dream. In the Maharishi's dream Sre Gorakkar appeared before him and told him that there was a place called 'Gorakkar Kundam' a part of Kollimalai where he would find the Divine secrets written on palm leaves. He also told Sre Bhaaskharamaharishi that Sre Gorakkar was willing to offer him bundles of palm leaves, which contains Divine secrets. Obeying the holy command of his Preceptor (Guru) Sre Bhaaskharamaharishi left for Gorakkar Kundam. At Gorakkar Kundam he found the palm leaves bearing the Holy secrets. After completing his Divine Mission Sre Bhaaskharamaharishi returned home. At home, Maharishi dreamt holy dreams for seven consecutive days. The Supreme Preceptor of the Universe - "Sre Kagabujandar" appeared before him in his dreams and gave him the necessary teachings on how the secrets written on palm leaves ought to be read. On the occasion of Thiruvathirai (Arudhra) which falls in the month of Margali on an Arudhra full moon day, The Supreme Preceptor of the Universe - "Sre Kagabujandar" reappeared before him and Blessed him with the seven kinds of Gnana Deekshai's (Divine Teachings). From January 1993, onwards Sre Bhaaskharamaharishi began his Divine Mission of giving explanations regarding Nadi predictions according to Nadi Astrology to the world. People developed a fondness for Sre Kagabujandar's Nadi Astrology. 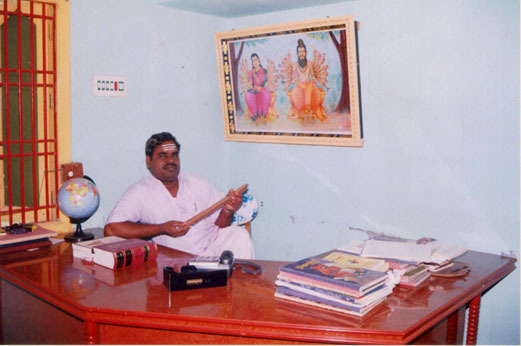 Complying with the desire of people Sre Bhaaskharamaharishi set up a Nadi Astrological Research Centre at Kanchipuram in 1994 and engaged himself in rendering spiritual services to the people. South Indians, North Indians and foreigners flocked to Sre Bhaaskharamaharishi with great eagerness to hear the predictions handed over to Sre Bhaaskharamaharishi from his sacred lips. The predictions given by the Maharishi helped to minimize the miseries of the people who came to him and people found happiness in life. He engaged himself in the divine service of giving predictions at his Astrological Research Centre at Kanchipuram while his residence was at Sothiyambakkam, and his fame grew day by day. According to the Blessings bestowed on Sre Bhaaskharamaharishi, by The Supreme Preceptor of the Universe - "Sre Kagabujandar"("Sre Kakabusundi")in his dream, Sre Bhaaskharamaharishi received a huge some of money from the Government as prize. The Blessings of his Preceptor (Guru) enabled him to raise the standard of living. Sre Bhaaskharamaharishi then left his native village of Sothiyambakkam and moved to his newly constructed house at Kanchipuram with his wife and children. He then shifted the office of the 'Sre Kagabujandar Nadi Astrological Research Centre' to his new residence at 77-Arignar Anna Street in Kachchabeswarar Nagar at Pillaiyarpalayam, Kanchipuram, 631501. Sre Bhaaskharamaharishi who discovered a treatise named the "Sre Kagabujandar Manai Latchanamirtham-7000" from one of the palm leaves, came to understand that only a part of the Science of Vastu Sastra lives in the present world. The Divine Science of Architecture (Vastu Sastra) is considered to be one of the famous divine arts of the Siththas. For the benefit of the people Sre Bhaaskharamaharishi spent money from his own pocket in order to give complete explanations on the Divine Science of Architecture (Vastu Sastra) through Television network for a period of six weeks. People appreciated him for his ability and the generosity of the Maharishi for rendering free service through the Television Network. 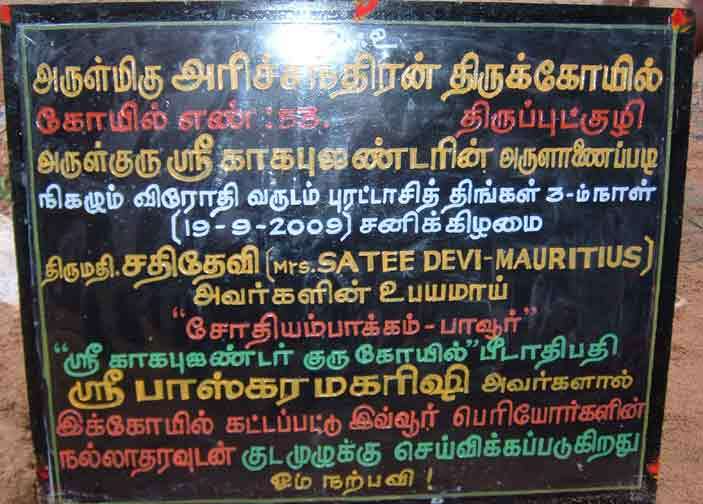 Apart from this, Maharishi who continues to render Divine service to the public (by giving Nadi Astrological predictions) has undertaken the task of listing important secrets contained in the treatise - "Sre Kagabujandar Manai Latchanamirtham-7000" found in the palm leaves giving explanations (demonstrated with the help of diagrams) of one thousand poems, grouping them under the title "Sre Kagabujandar Siththar Vastu Sasthiram-volume 1, and by publishing the treatise in Tamil. The book written by the Maharishi earned the good will of the people and thousands of copies of the book were sold. Sre Bhaaskharamaharishi wanted men to understand the great truth given by the Nadi Astrology. It was his desire that people should come to know the predictions given by Nadi Astrology to wipe out miseries from their lives and live a happy and peaceful life. So on 3 rd, November 1998, he hosted his own website known as http://www.kagabujandar.org Through his web, the Maharishi renders free service on the chapter 'prasanna pirachchanai ghandham' .He also gives paid predictions on the eighteen chapters (Ghandhams) and a special chapter on prasanna pirachchanai ghandham and lives in great fame. In answer to the call of the Malaysians, Maharishi travelled to Malaysia in the year 2000, stayed there for a month, rendered service by giving predictions according to the Nadi Astrology, blessed the people of the country and returned to his Motherland-India. Sre Bhaaskharamaharishi had a profound interest for the ancient arts. 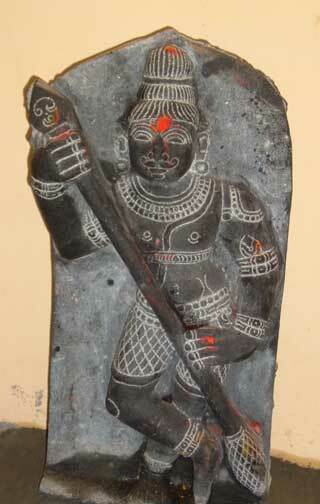 He excelled in the art known as 'kattaikuttu' (kattaikooththu), which is regarded as one of the ancient arts. The men in the maternal grandfather's family (of the Maharishi) were skilful in displaying the art of 'kattaikuttu'. Maharishi who himself, was deeply interested in the art took up the roles of Krishna, Karna and Arjuna respectively and enacted in scenes from the 'Mahabharatha'. 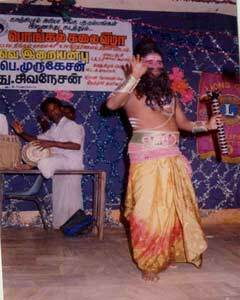 His performance was presented before the audience in the form of 'kattaikuttu'. He took up the character of 'Arjuna' in the drama "The State of Arjuna's Penance". The scene depicting Arjuna doing his penance was presented before an invited audience and earned him fame. It gave him immense pleasure to think that could enact the scene to the entire satisfaction of the public. Maharishi continued in his venture to stage dramas about 'Harichandra' in many villages to enforce the principles of truth and justice and this motivates people lead an ideal life. Thus Maharishi has paved the way for people to uphold truth and justice in order to make their lives sublime. Sre Bhaaskharamaharishi has constructed 54 Sathya Harishchandra Temples so far in and around the Mukthi Kshetra Kanchipuram.In General everybody will fear to make attempt to construct Harishchandra Temple,But He is continuousely engaging Himself on construction of Sathya Harishchandra Temples and He is probagating and teaching the greatness of Truthness and Justice to the world as a true disciple of Mahatma Gandhi The Father of Indian Nation.It is wellknown to all that Mohandas Karam Chand Gandhi became as Mahatma Ghandhai after he watched the Satyavadi Harishchandra Drama during His childhood, and hence the history of Sathya Harishchandra is too energetic and powerfull.Sre Bhaaskharamaharishi is in desire to construct 1008 Sre Harishchandra Temples all over the earth wherever there is graveyards (Crematorim/Buriel ground) exists without Harishchandra Temples. 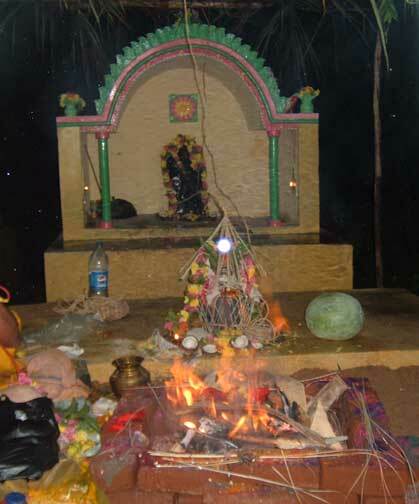 As per the Hindu Tradition, after the death of human being , the Body will be placed infront of the Sre Harishchandra Temple and the Poojas and Abhishekhams(Prayer rituals) will be conducted to Sathya Harishchandra, and then after getting the permission from Harishchandra, then only the body will be cremated or buried.Hence,The Sathya Harishchandra is the Authorized earthly representative of Lord Yama and He only desires the status of departed soles after the death whether to send the sole to Naraha Loga(hell) or Sorga Loga,(salvation) based on the deeds experienced by the departed sole over the earth during the lived period. But,it is very unfortunate that ninety percent of villages don't have Sathya Harishchandra Temples in Buriel grounds (Crematorium/Graveyards).But,the peoples will treat any near by black stone found nearby to the Crematorium and treats it as Satya Harishchandra and performing Abhishekhams and Arathna (Prayers and offerings)to such stones by treating as Harishchandra and then only after getting permission the body head will be turned and then it will be taken for final rites.So,Sre Harishchandra have Supreme importance in Hindu Mithology And He is the God who verifies the finanal accounts of the departed soles over the earth by acting as the direct representative of Lord Yama.If He wishes, then the sole will attain upper status of Sorga(Heaven) and rebirth and if He will not bless then the soles will go for Naraga(Hell). But,it is really unfortunate that no body has taken interest to construct such Temples in Buriel grounds (Crematoriums/Graveyards)and nobody has taken interest on Donating money to proceed with such great deed eventhough multi millionaires and croriers and lakhpathi's are living in this world and they don't know their money will be useless after the death.Hence,the fact of accumulating Punniyas (good deeds)during the living time is must to enjoy the joy after death.We have taken an attempt to fulfill such ashame found in the Graveyards of Hindu Crematoriums and we succeeded with 54 Temples constructed so far through our beloved Donors and it is our desire to fulfill every Hindu crematorium with an Harishchandra Temple of real shape instead of empty stones. 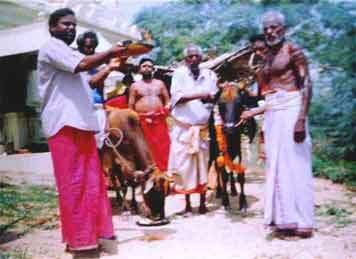 It is the duty of every human being to perform Punniyas in the name of deceased parents inorder to uplift the deceased soles into higher level.Your deseased parents may live in hell and they may anticipate the good deeds of their children or grand children inorder to get blessed with sorga loga (Heaven) or good rebirth.Hence,if you perform a Supreme deed in the Name of your beloved deceased Father or Mother or Grand Father or Grand mother, they will bless you for good life and they will also blessed with higher position through the Supreme Divine graces. It is the best deed to Donate an Harishchandra Temple in the name of your deceased beloved parents or grand parents.It is because Sathya Harishchandra is the God who will bear the good deeds to the divine account of the deceased soles and hence if you construct His Temple in a Graveyard, He will become very happy and He will bless you and your family and all of your deceased grand parents to good status and this is the powerfull and Supreme deed and there is no Supreme deed equivalent to this because Sathya Harishchandra is the only God of Truth. Hence, if you desires to Donate an Harishchandra Temple, we are ready to execute it properly on Divine Trust on behalf of you.If you really likes to utilise this opportunity kindly contact us for further proceedings.By Constructing and performing Kumbabishekham (Consecration) to Sre Harishchandra Temple the full blessings of Sre Harishchandra will be availed to you.As per the Holy history of Lord Harishchandra,He was tested by all the Nine Planets and preferably by Lord Saturn Severaly through Sade - Sati (Seven and half years ruling of Lord Sani) and He was affected by the thoshas(Evils)of all the nine planets and He lost His Kingdom,His citizens,His properties,His wife,His Son and everything and He worked at Crematorium of Kasi (Banaras - Harishchandra Ghat)Buriel ground and experienced all Supreme difficulties of life and finally He was again blessed with everything and He got restored with all He lost and He is still ruling this world with the Law of Dharma(Law of Righteousness).Hence,the persons those experiencing very cruels on this birth on the continuation of last birth sins will get restored on this present life through the Supreme graces of Lord Harishchandra by performing this Supreme remedy. Hence, it is the Supreme deed than cremating the dead bodies in Kasi Harishchandra Ghat and Manikarniga Ghat Crematoriums, because once Sre Harishchandra Statue get installed in a Crematorium then it becomes equivalent to Kasi Crematorium(Banaras - Varanasi).It is impossible to all Hindus to go to Kasi due to financial constraints,But the dead body will be cremated in Harishchandra Temple installed crematorium then the same benefits availed to such departed soles.Hence,If you likes to proceed with your divine duty,then kindly let us know to proceed with your desires through the Supreme graces of Sre Kagabujandar.On your kind donation we will perform your remedy through our "Sre Kagabujandar Charitable Foundation" with full rituals ad we will despatch the prasadams and the CD of the function to you.We will welcome you or your friends or relatives to attend the function if possible on your end to fulfill your desires satisfactorily.On Fulfilment of the Remedy,Immediately Your Name Will be updated in the Donor List of our website under the head Details of Harishchandra Temples constructed through our Charitable Trust. The Cost involved on Sre Harishchandra remedy is Rs.40,000/ (Forty Thousand Rupees) which is Equivalent to US $ 900.On receipt of your kind donation, We will select a village by first and then We will Construct the Temple by next and then we will proceed with the Kumbabishekham function (opening ceremony) by fixing the programme schedule.On completion of construction work we will send you the programme schedule and We will invite you or your authorised representatives to attend the function.On completion of the function we will despatch the Divine prasadams and Photographs of the function to you through registered post.On Fulfilment of the Remedy,Immediately Your Name Will be updated in the Donor List of our website under the head Details of Harishchandra Temples constructed through our Charitable Trust. The amount involved in this Supreme Remedy is too high and it is due to the high on cost of construction activities,But it is most powerfull remedy and it will restore hard complications of life.Hence,we accepts the payment for this remedy as two instalments costs Rs.20,000/- (US $ 450) on each instalments.We will start the work once we gets your first instalment and we will perform the ceremony after the receipt of second instalment within the span of next one month. Kindly contact us if you likes to Donate A Harishchandra Temple in the name of your deceased beloved Father/Mother/Grand Father/Grand Mother.If you will Donate there is no good deed (Punniya) than this ever in this world. Service was the very air that Maharishi breathed. In 1998, Maharishi became a member of an International service institution called 'The Lions Club' and played an active part by rendering social service through the Lions Club. 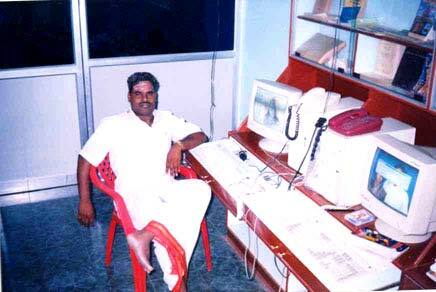 He held many posts in the 'Lions Club of Kanchipuram Pallavan City', a club that is one of the best Lions club. Adhering to the command of his Preceptor(Guru) and in accordance with his good intention of rendering charitable services, Maharishi founded "Sre Kagabujandar Charitable Foundation", and became the Managing Trustee of the Trust. Adhering to the holy command of his Preceptor Sre Kagabujandar in one of his dreams, at first he laid the foundation stone for the construction of "Sre Kagabujandar Guru Temple and Performed Kumbabishekham Ceremony on 12th June 2003 at 'Sothiyambakkam' where the Maharishi was born, brought up and prospered in life. He was already spent considerable sum of money for the temple with the best Architectural skill found nowhere else in the world. Guriji�s goal is that the temple should rank first with respect to Architecture, it should be provided with all the parts dealt with in the treatise "Siththar Siva Agama Sastra" and "Siththar Manai Latchanamirtham".He has started the Further Construction work now and the work is going on now.Donors are heartly welcome. 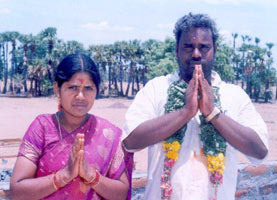 If people come forward and donate generously for the noble cause to the "Sre Kagabujandar Charitable Foundation", the remaining construction work of the temple would be completed very soon and it is certain that people would witness the Second and great purifying ceremony within a very short span of time. Maharishi also desires to reconstruct dismantled Siva temples, which have been constructed only with a part of the 'Siva Agama Sastra'. He is keenly interested in constructing them with the spiritual grace said to belong to that particular sacred place. Moreover employing a different kind of Architectural skill in designing the construction should bring out the spiritual importance and history attached to the place. In addition to this, the Maharishi is working with a will to create a record in 'Siva Agama Sastra'. It is the Maharishi's desire that people should make use of the services that Maharishi is always ready to render, by approaching him for getting explanations regarding 'Siddhar Siva Agama Sastra'. Moreover he wants to construct temples according to the code of laws laid down by the 'Siva Agama Sastra' in order to enable (the) people in the world to get the desired results and turn their lives into gardens of happiness. Maharishi has a great desire to publish more spiritual books. According to the information written on the palm leaf, this is the four hundred and seventieth Birth of the Maharishi namely- Sre Bhaaskharamaharishi. The great truth that in the age-Namely the 'Duvaphara Yuga' he took the incarnation of 'Karna' and received the direct advice of The Supreme Preceptor of the Universe - "Sre Kagabujandar" is sweet news. The moles, scars and other identification marks that were present in Karna's body as specified in the 'Mahabharatha' continue to be present in this birth too. This is a great truth. Another valuable information contained in the Sre Kagabujandar's palm leaf was that he rendered countless services by constructing thousands of temples from his four hundred and fiftieth birth till his past birth namely- his four hundred and sixty-ninth birth. It is mentioned that he possessed a sound knowledge of 'Siva Agama Sastra', he had been a linguist and by virtue of his profound knowledge in other languages, he was able to give sound advice to the masses in his past births. In his four hundred and fifty-fourth birth, the Maharishi was born in Japan and had constructed many Buddhist temples there. In order to make sure (To ascertain,) that is no break in the continuity of good deeds done (as in the past births,) Maharishi is going to construct one of the best Buddhist temple in this four hundred and seventieth birth as per the information given about him in the palm leaves.